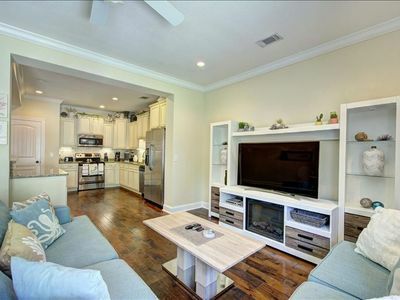 Spacious townhome in one of Saint Simons most popular new communities, Mariners Landing. Quick on/off Island access makes for an easy commute to FLETC. Well-appointed 3 bedrooms, 2½ baths, screened patio, one-car garage and equipped with everything you need for comfortable living. Recently decorated and outfitted with pristine new furnishings, new linens and everything you need in kitchenware. Living Room has 55” Smart TV with whole house DVR. All utilities included along with highspeed WiFi and cable with 120+ channels. The expansive Master Bedroom includes a top-of-the-line king-size adjustable bed, memory foam pillows, luxurious bedding and black-out drapes for a restful, relaxed night’s sleep. It also has a 50” Smart TV, large walk-in closet and private bathroom with large garden tub, shower, separate toilet room and dual sink vanity. The 2nd and 3rd bedrooms feature high-end queen-size beds. All bedrooms have an extra set of quality sheets, blanket and extra pillows. All beds and pillows have mattress/pillow protectors to guarantee our guests with a clean experience every time. Full Laundry Room upstairs to make laundry a breeze. 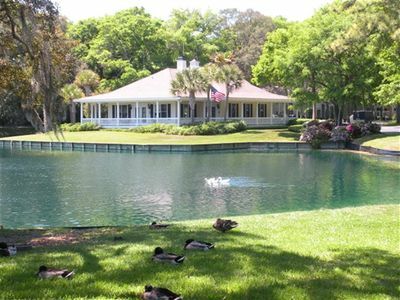 Mariners Landing has a resort style pool with two bathhouses overlooking a pond and fountain. All just a few steps from home. Walk to Gascoigne Park to enjoy a fitness trail, a frisbee golf course, fishing pier and Saint Simons Marina. It is also a great spot to watch the sun set. Also in walking distance is Epworth by the Sea with the Tabby Slave Cabins historical site. You will be just minutes to beaches, the Village & Pier and everything Saint Simons has to offer. Additional amenities include a Pack-n-Play, highchair, and a take-a-book/leave-a-book library (master bedroom). Two bicycles, two beach chairs and beach tote. Our home has a “starter kit” to help you kick-start your vacation. Kitchen Keurig with k-cups, sweetener and creamer Dishes, flatware and glass to accommodate 8 guest Pots, pans, bakeware and utensils Toaster, blender, crockpot and hand mixer Dish soap and Dishwasher detergent 1 roll paper towels Trash bags Bathroom 2 rolls toilet paper each bathroom Travel-size shampoo, conditioner & soap each bath Full-size body wash and bath salts in master bathroom Hair dryers in full bathrooms Additional Extras 2 adult bikes 2 Beach chairs 6 Beach towels Beach tote Board games for many ages. Take-a-book leave-a-book library (master bedroom) Check-in is at 4pm, check-out is at 10am. Due to housekeeping, early check-in and late check-out cannot be accommodated. This 2 bedroom loft at White Gables is centrally-located to some of the Island's best restaurants. We're an easy 5 min walk to the King & Prince Hotel and East Beach, a local favorite. New furnishings, comfy bedding, and reliable wifi. This spacious loft has a kitchen, big bathroom, office nook and private deck. 15 minute walk to the village. This is instant book listing. If the calendar dates show available, there is no need to message me. The total price will be displayed at booking. 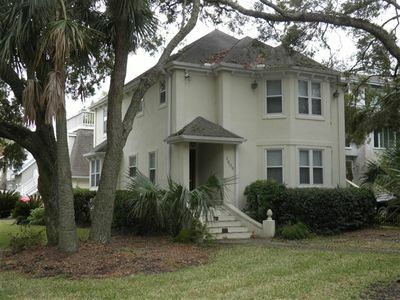 St. Simons Island 'Banana House' - 5 Min to Beach! This exquisite Two Story, 6 Bedroom/4 Bathroom OCEAN FRONT cottage features spacious living areas, a pool (heating available for additional $200) and a beautifully landscaped yard. The upstairs balcony and sundeck are perfect for lounging and enjoying the ocean sounds. Downstairs features tumbled limestone floors throughout. State of the Art Kitchen is a cook's dream with Granite Counter Tops, Stainless Steel Appliances, limestone floors & backsplash. The pool area includes: Wrought iron dining table seating 6, Single & Double Lounge Chairs all complete with comfortable, sunbrella cushions, outdoor shower & gas grill. 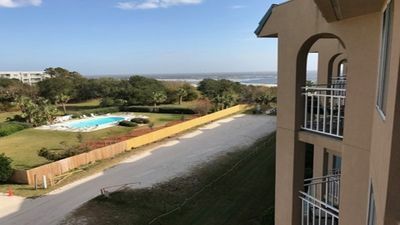 THIS IS THE LARGEST OCEANFRONT RENTAL HOME on Jekyll Island, you won't find a better place to call home during your vacation. 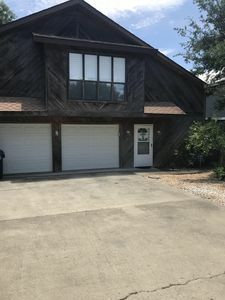 Amenities include: direct beach access, a Swimming pool, Six HDTV’s & DVDs, 2 Fireplaces, Full Laundry Room, High Speed Wireless Internet, Cable including premium movie channel package, Gas Grill, beach access, & so much more!!! Downstairs includes: *1 Queen Bedroom & Full Bathroom *Kitchen, Bar & Breakfast room *Dining Room, Living Room, Family Room *Upstairs includes: *1-Master Suite w/ King Bed & Full Bathroom (Jetted Tub & Separate Shower) *1-Twin Room with Two Twin Beds (ocean view) *1-Queen Room (Ocean view & Balcony) *1-Queen Room with Two Queen Beds (Ocean view & Balcony) *1-Twin Trundle bed room- two twins total *2-Full Bathrooms *1-Laundry Room (Washer, Dryer, Iron & Ironing Board) *Upstairs Den with pullout queen sofa bed All About Jekyll Island:: Jekyll Island was the winter home for the wealthiest families in America during the Gilded Age. Since 1947 the Island has been owned by the State of Georgia. For this reason, it remains timeless in many ways. Jekyll Island is still a quaint little village where traffic and stress are rarely found. On the island you will enjoy golf plenty, a fantastic water park, historic homes & shops, a full service marina, bike & walking paths, excellent dining, Putt Putt Golf, fishing on the beach or pier, horse back riding, and of course all that goes along with the magnificent Atlantic Ocean and beach. Visit the GEORGIA SEA TURTLE CENTER where you can explore exhibits on sea turtle conservation, rehabilitation, and their amazing journey from egg to adulthood. School field trips, public programs, and special events will highlight Georgia’s unique coastal ecosystem and the mysterious world of these ancient reptiles. Red Top Cottage just a hop, skip and a jump away from beach access! 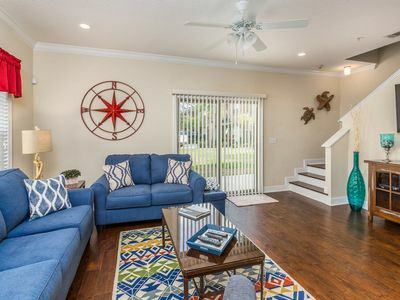 This wonderful St. Simons Island townhome, 1 block from the King & Prince Hotel & the beach, is beautifully furnished and offers its occupants a wonderful retreat from everyday life. Neptune-near-the-Sea sleeps 8 & features 2300 square feet, 3 bedrooms, 3 1/2 baths, a 1-car garage, & an elevator from the garage to the top living level. There are small front porches & large back porches on all 3 living levels. The open-design first living level contains the high-ceilinged living room, the charming dining room & well-equipped kitchen. 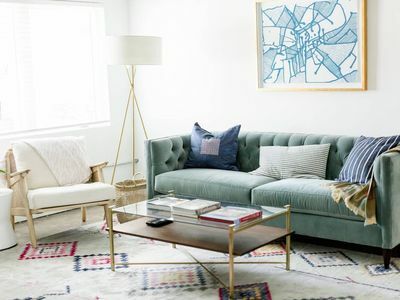 The home is delightfully appointed with photos and artwork, and a plethora of other accessories like fun knick-knacks & little antiques that make the home very warm and inviting. The owners have carefully & tastefully decorated Neptune-near-the-Sea for maximum comfort, & want you to enjoy this special getaway spot. One of a Kind Home. Large Private Pool. Walk to Beach & Village. Sleep 16. 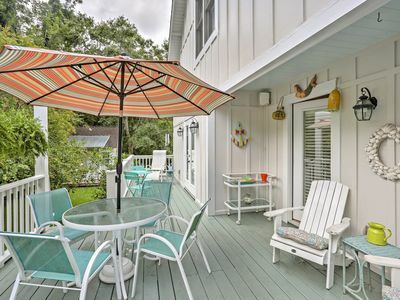 Chic St. Simons Townhome w/ Patio + Pool Access! This 1 bedroom apartment at White Gables is all about luxury and being close to it all! We are a 5 min walk from East beach, a local favorite. Enjoy many dining options right outside the front door! 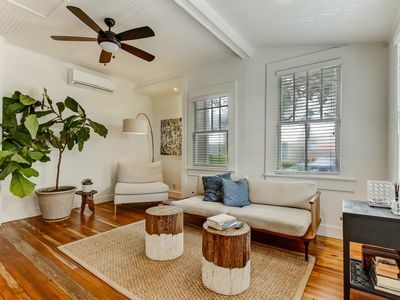 Recently renovated to include all the modern comforts of home, in a historic St Simons Beach Cottage. Full kitchen, new furniture, comfy bedding and reliable wifi. This is instant book listing. If the calendar dates show available, there is no need to message me to confirm. 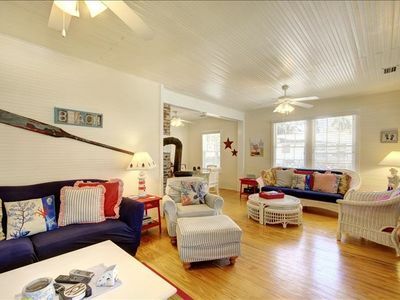 Relax in this charming authentic beach cottage located in the pier/village area of St. Simons Island. This 3-bedroom, 2-bath home can easily sleep 6 people and can also accommodate 2 more in the sleeping cove off the front bedroom. Enjoy grilling and chilling under the majestic oak tree on the back deck or in the hot tub located on the deck. Each bedroom includes a ceiling fan as well as a large flat screen Smart TV. The cottage is recently remodeled and redecorated furnished with quality linens and decor and is new to the rental market. MONTHLY DISCOUNTS AVAILABLE. PLEASE SEND AN INQUIRY FOR A QUOTE. FOR GA/FL WEEKEND, ALL GUESTS MUST BE AT LEAST 25 YEARS OF AGE. PHOTO ID's WILL BE REQUIRED AT CHECK-IN. NO EXCEPTIONS. This lovely ground level condo is located in a gated community. The amenities in this complex include a community swimming pool and workout room. The condo has 2 bedrooms and 2 bathrooms. The living room and each bedroom has a televisoin. Wifi is included. There is a screened porch for relaxing outdoors. The condo is conveniently located near restaurants and shopping. It's located a short 2-1/2 miles from the St. Simons Island Village and Pier. Small pets considered. MINIMUM AGE: 25; NO SMOKING; CK-IN 4:00 / CK-OUT 10:00. FOR MONTHLY RATES, PLEASE SEND US AN INQUIRY FOR A DISCOUNTED QUOTE. 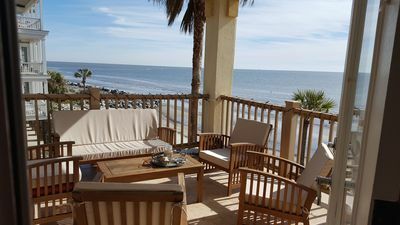 We have great spring break rates available... Also Go online and get a rate quote for this luxury home for your vacation this Spring & Summer.......We are about a mile and half walk to the Pier/Village area ....... We are a Private Luxury Home in a Gated Community Near the Retreat Clubhouse.... Available with possible Sea Island Club Membership/Email us for membership pricing....Is there truly a luxurious alternative to The Lodge or The Cloister? We think there is. If you want more than a condo or a cottage, you've found it. If you want a luxurious alternative, you've found it. We offer three spacious guest rooms and three and one half baths. A terrific kitchen for the gourmet cook with all the amenities a discriminating guest will desire. Granite countertops and top of the line stainless Kitchen Aid appliances. The kitchen features double ovens, and dual dishwashers. Even if you only have breakfast and/or lunch at home, you'll find all you need. The master suite is located privately, upstairs, away from all the activity of the home. It provides you with all the amenities you are accustomed to in your own home. Jacuzzi jetted tub, a separate shower with multiple body jet sprays. His and Hers vanities with granite imported from Africa. Travertine shower and floors that are reminiscent of the Beach Club at Sea Island. The Tommy Bahama King size bed with luxurious linen awaits you. A comfortable seating area with a 42 inch flat screen TV is there to catch up on the local weather forecast, latest news or stock market activity. There are His and Hers separate closets for your convenience. The guest rooms are located on the main level. One has a King bed and a private bath with a tub/shower combination. The other has two Full size beds and a private bath with a beautiful white marble shower. Nothing has been overlooked. Both guest rooms offer flat screen TVs with DVD players. The home has two living areas. One is a softer, quieter room with Tommy Bahama furnishings. It offers an office area with a New Queen Sleeper Sofa, Tommy Bahama desk for your laptop, a quiet reading corner, a game table, a library, a gas fireplace and a 42 inch flat screen TV. The other living room is an excellent theater room for entertainment! Enjoy a 60 inch Sony TV with full surround sound. You may watch a movie on the DVD player or enjoy your very own music line-up on your IPod. A wet bar is also in the room so you may enjoy your favorite libation. It is a wonderful room to watch a movie or sporting event away from the bars and crowds of the Island! The artwork in the room is by local favorite photographer and artist, Patsy Smith Roberts. Outside, on the deck, you'll find an outdoor kitchen and dining area for entertaining as well as a comfortable lounge area in front of the outdoor fireplace. We have Comcast cable TV, wireless Internet, and local as well as long distance telephone services provided to you at no cost. You are welcome to park in the garage to avoid any inclement weather. There is a laundry room with front load high-efficiency machines for your convenience. We welcome you as our guests. SANDCASTLE COVE - South end of island, just minutes to beach & peir village. 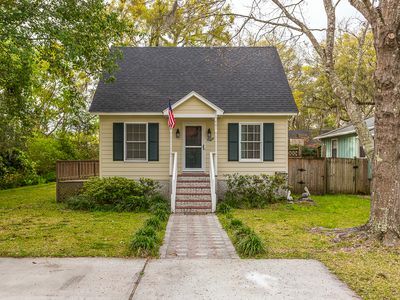 Recently renovated in 2018, this home shows pride of ownership. 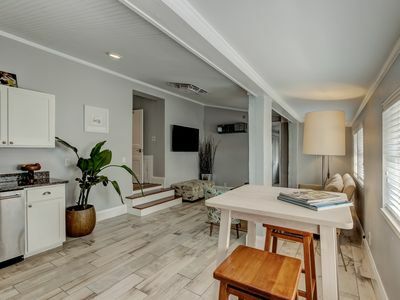 Enjoy updated decor, custom linens, a custom kitchen and a true beach house feel. Walking distance to the beach and town, down the street from amazing BBQ restaurants and nightlife. 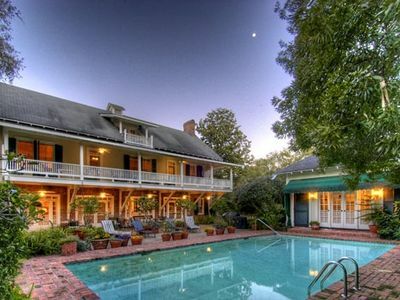 Enjoy the canopy of old mossy oaks over the refreshing outdoor pool. Bikes and golf carts are available for rental on the island for a nominal fee. Great way to get around and explore this beautiful island. Walk to the village/pier and beach...3 bedroom 2 bath home!!! 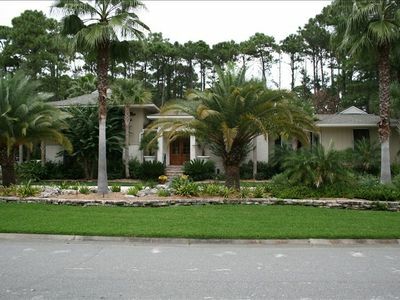 This home is located just minutes from the pier/village area and public beach access. It has 3 bedrooms and 2 baths, large 2 car garage, screened in porch and open deck on the main living level. Open living and dining rooms, full kitchen and full size washer and dryer. There are 2 queen beds and 2 twin beds home sleeps 6. This is a location, location, location home!!! You can ride bikes or take a short drive to all the close local restaurants, shopping and much more. 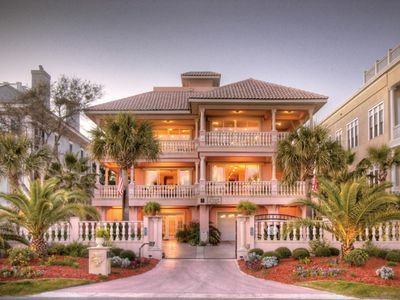 This iconic St. Simons property is just 1 block from the beach. Having undergone a recent rehab, this upstairs apartment is exactly what you need for a luxury beach vacation. A 30-second walk to the beach, 2 min walk from King & Prince, 10 min walk to the village. We provide high-quality bedding, towels and kitchen supplies. We are your home away from home, offering an unforgettable 5-star experience. A sweet & comfy 3 bedroom home - easy on/off island. 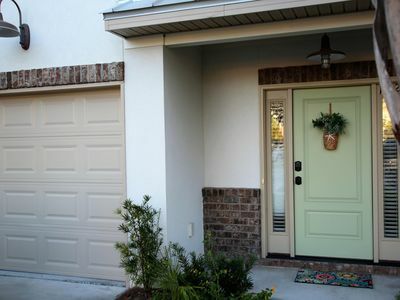 Egret's Landing is a beautiful and comfortable 3 bedroom home in a quiet residential neighborhood. A grocery store, CVS and several other stores and restaurants are within walking distance. The beach and "The Village" are only 4 miles away by bike or car. It is easy to get on and off the island as we are located very close to one of the roads connecting to the mainland. The small grassy area and deck are completely fenced in. Up to 2 dogs are allowed with a non-refundable pet fee of $100 per dog per stay. Our neighborhood is eclectic, relaxed and friendly. At night it is quiet and very dark! You will find lots of locals walking their dogs around the neighborhood and many people will stop and chat. The house has 1 bedroom and 1 unattached bathroom on the main floor. Upstairs are two smaller bedrooms and a full bathroom. In the back there is a deck and a small grassy pet area. There is also a back building which is our office and repair shop that we access through a separate entrance. The cottage is a super unique, luxurious one bedroom, one bath space. Sleeps four with queen bed in bedroom and a queen pullout couch with memory foam mattress. Always immaculately clean, it is in a great location on quiet residential dead end street with duck and fish pond at end of street about 100 yards away. Enjoy strolling down to the duck pond to feed the ducks, fish or many turtles. The property has lots of large majestic Georgia oak trees and palm trees on the property and street. The location of this cottage is ideal being 2 1/2 miles from the public beach and pier / light house. Also, very close to Harris Teeter, Island Cinema movie theater, great restaurant and shopping. Cottage is approx. 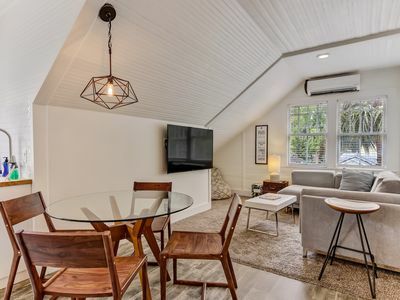 850 sq feet including a full kitchen with microwave, stove, full refrig, dishwasher, keureg one cup coffee maker or a regular drip coffee maker. Comes with free wireless internet that is super fast at 90 megabytes per second. Download or stream movies quickly with no problems. Washer and dryer available so you can do laundry on site. Newly added outdoor shower to wash off from a day at the beach and private stone patio for outdoor relaxing. Cathedral ceiling with wood beams make this cottage exceptionally coastal elegant through out. Hardwood floors throughout exude luxury. Large main living area with flat screen TV with HD box so pictures is phenomenal. Has glass top breakfast table as well as a large dining table and custom built in corner bench seating. The master bed room is behind the yellow sliding barn door and has room for two and also has a flat screen TV and a DVD player. The bedroom is tastefully decorated in beach style. Off the master bedroom is a spacious spa bathroom. The design of the walk-in shower was taken from the Sea Island Club Spa. It has a special shower head that produces exceptional water volume and is like showering in a spa. Its like nothing you have ever experienced. The floor and shower are natural travertine castle stone and the shower has multiple patterns. The Kitchen is fully stocked with plates, cups, silver ware, knife block and items needed for cooking. A sampling of coffee pods are provided for your morning coffee enjoyment. Coffee can be enjoyed inside or outside on the spacious deck or below on the private patio. You'll feel like you are in the tree tops with the good high views. Across the street is Harris Teeter, a large grocery store. We will gladly provide you with restaurant recommendations, directions and island activities that only locals know about. We are confident that you will be pleased with your stay in our five star island cottage and we think it sometimes is the small details that make the biggest difference. Like a 5 port USB phone/ pad/ laptop charging tower provided so you can charge all your "things" without struggling to plug cords in behind end table or bedside tables. We have tried to think of everything to impress you. 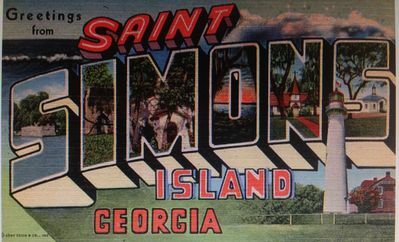 Our goal is for you to want to stay with us every time you visit Saint Simon's Island. While our listings do say pets considered we cannot accommodate dogs over 15 lbs due to the desire to keep our properties the highest quality available. There are no bikes provided with the cottage but we have established a relationship with Island Bikes and for our guests they will deliver and pick up the bikes. If our cottage is booked for your dates, never fear, we have six other luxury rental properties (property 3996622, 4061158, 4014613, 4653229, 7471439 and 4757544) Our goal is to provide a unique experience with the highest level of luxury at the lowest price. We hope you will decide to stay with us. You will be happy you did. If you like being close to everything and staying in an upscale, gated, quiet, relaxing spacious condo, look no further, you have just found it. 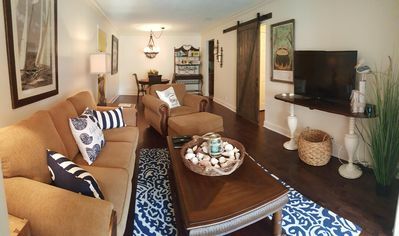 We think our Island Retreat, gated, ground floor condo is the best luxury 1 bedroom 1 bath vacation condo, at a steal, on St. Simons Island. Located in Island Retreat, our condo is one and three quarter mile from East Beach and the Pier area. We go the extra mile to insure that the condo is always immaculately clean. This condo is located on the ground floor and the 1,000 sq feet is all one level, so no steps outside or in. The luxury condo is perfect for one or as many as four using an expensive, king sized mattress and a pullout queen sleeper sofa. The condo is located in the gated condo community of Island Retreat which is in one of the best south Island areas. The condo is adjacent to the Starbucks, Chick Fliet, Ember, Mas Burger King, Locos Restaurant, Winn Dixie Grocery, McDonalds and many other restaurants. Redfern Village, where many other restaurants and shops are located is just around the corner. The public beach, East Beach and the Pier Village and lighthouse are about a mile and three quarters away. The kitchen is fully stocked with everything you need to cook any meal, including coffee maker, toasters, pots, pan, cookie sheet, knife set, electric wine opener, coffee mugs etc. The condo is tastefully and professionally decorated in Island stylings and is steeped in luxurious high end furnishing, linens, kitchen utensils, robes and HD TV's. There is a 48 inch HD Smart TV in the living room and a 40 inch HD TV in the bedroom and don't miss this, you will get over 150 channels including HBO and Showtime. Why be without your Netflicks or other content provider when you can use them in our condo on a large TV. The free wireless internet is super fast at 75 mbps. Stream your favorite movies or shows with no delays. The comforter on the bed is new and very high end down alternative like you would see at a high end hotel. My wife and I believe that it is the small things that make our guests vacation lodging special and one of those is having the best of everything in the condo. From a high end mattress that provides a great nights sleep, too soft luxurious robes, to free wireless high speed internet and HD TV's in the living room and bedroom, we want your experience to be the finest. The pool, fitness center and tennis courts, which are open year round are super close to the condo at about 100 paces. There is a kids play ground right beside the condo as well. The condo also comes with a washing machine and dryer and we supply laundry pods. 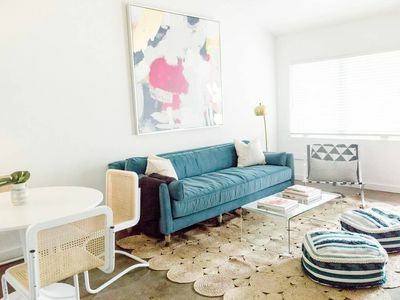 Plus, the unit is about 100 yards from the gate so when you go for a bike ride you don't spend all your time and energy biking a long distance through a complex or neighborhood, like other vacation rentals. Our goal is for you to want to stay with us every time you visit, have a unique experience and for you to brag to your friends that you found the greatest place at a steal. Thanks for considering our vacation rental condo for your stay. If you have any questions at all please ask. We respond very quickly and we also provide a restaurant recommendation list and a list of fun things to do on SSI. We also make renting easy as we use a door lock that has a numbered key pad, so there are no keys to worry about. I simply email you the door code about a week prior to your arrival. We also provide early check ins and later check outs, if we do not have other guests checking in the same day. We truly go the extra mile for you. We have tried to simplify everything so you can focus on your vacation. While our listings do say pets considered we cannot accommodate dogs over 15 lbs due to the desire to keep our properties the highest quality available. If this property is booked for your vacation dates, we have four other rentals that we hope you will check out. They are all on VRBO / Homeaway and the property numbers are : 3690215, 3996622 , 4014613, 7471439, 4653229 and 4757544. From 1 bdrms to a 5 bdrm house, we have a space for you. Super open, spacious four bedroom and 3 bathroom, 2,118 square foot home located in upscale neighborhood Harrison Pointe. 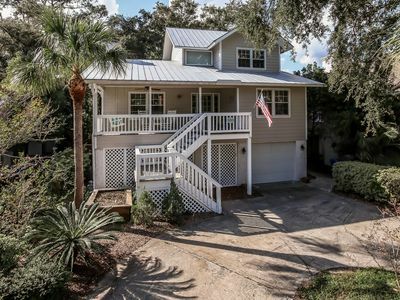 This vacation home is two stories with a big front porch, large back deck, front and back yard and garage. Grill up your favorite foods on the new gas grill available to you on the back deck that is just a few steps from the breakfast area and kitchen. You and your family or friends can enjoy eating or relaxing outside in the new patio chairs and table. 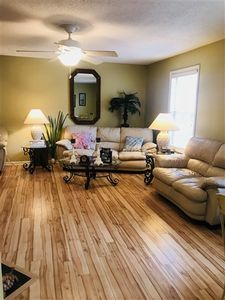 Inside the home on the first floor you will find a gorgeously decorated living room with fireplace, ceiling fan, couch, chairs and 50 inch flat screen smart TV. Stream your favorite series or movie from your netflicks or amazon account or watch the channels on cable. You will have no trouble with the free wireless internet that has super high download speeds. 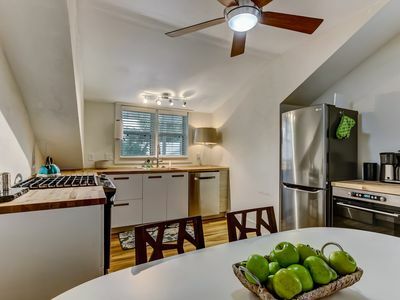 The galley kitchen boosts a nice stove/oven, refrigerator microwave, coffee maker, dish washer and large pantry. The breakfast area is great for morning coffee and has a beautiful desk and chair to work on your computer on or whatever you need to do. Also located downstairs is a bedroom with a queen bed and large closet and a full bathroom with shower. Off the kitchen is a stacked washer dryer for you to use. The dining room is right in line with the kitchen and is perfectly located to easily serve a large meal to your family or friends. The entire downstairs is beautiful hardwood floor with tile in the bathroom. The open floor plan and 10 foot ceilings will make you feel like you have all the space in the world to relax in. At the top of the new dark hardwood steps are the master bedroom and bathroom, a second bedroom with a queen bed and a 3rd bedroom with two twins beds. As you will see from the pictures the decor will definitely keep you in the that beach / Island vacation state of mind. 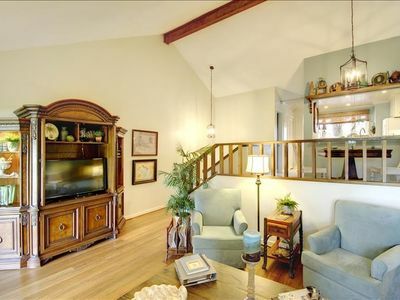 The master is huge and has a king bed and a ultra large bathroom and has dark hardwood floor. The other two bedrooms have new luxury carpet. Every wall in the house has been freshly painted and looks fantastic. This perfect vacation home is in a great located mid /south island in a upscale quite neighborhood with house from $300,000 to $800,000. It is located within walking distance to Harris Teeter, many shops, restaurants and the only movie theater on the island. You will not be disappointed with so much house at such an affordable price. Perfect for two families, a large family, family with grandparents or family with friends along. While our listings do say pets considered we cannot accommodate dogs over 15 lbs due to the desire to keep our properties the highest quality available. As a solution to this there are several doggie hotels/daycares nearby on St. Simons less than a mile from all our rental properties. If this house is booked for your dates we have other properties. Please see property numbers, 3996622, 3690215, 4061158 and our JUST ADDED, Super LUXURY home that sleeps as many as 8, property # 4757544. We hope you will stay with us. SEA TURTLE COVE - South end of island, just minutes to beach & peir village. 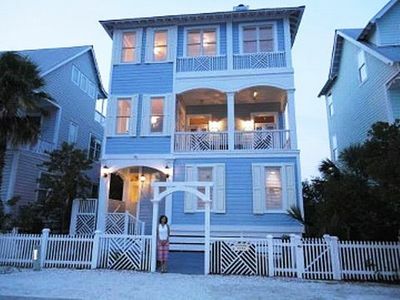 Welcome to Hideaway Cottage, one of the most popular ocean front homes on St Simons Island. Fully renovated in 2013, Hideaway is beautifully decorated, has incredible ocean views, a heated private pool, a fully equipped cooks kitchen and recreation room for the kids. What really sets Hideaway apart from other vacation homes on the island are the two fully furnished decks on the ocean, one off the main living area with an outdoor dining table, fireplace and a second deck off the master bedroom on the third floor that is the perfect romantic evening retreat. Hideaway is directly on the beach, steps away from the sand, located on one of the only beaches on the island that is not tidal. A cozy den is the perfect place to watch a movie or a ball game and the sonos sound system will fill the house and outdoor decks with your favorite music to add to your vacation experience at hideaway. Bikes available for island cruising. Sleeps 13 comfortably. For those that want one of the very best the St.Simons has to offer! Beautiful oceanfront 3 bedroom, 3 bath condo walking distance to the pier. Need a oceanfront vacation? This is the condo for you, 3 bedrooms and 3 full baths. Ocean views from the living room, dining room, kitchen and the master bedroom. Oceanfront balcony and steps down to the beach will make this your favorite vacation spot. The unit has a king in the master bedroom, a queen and twins in the other bedrooms, large kitchen and full size washer and dryer in the unit. The complex has a oceanfront pool and the beach access is just steps away. Family friendly sleeping 12, best beach for kids or for group of friends This Beach Villa has it all, 4 sleeping rooms, 4 baths, theatre, elevator, bidet', Jacuzzi, chef's kitchen, 800 sq ft of ocean front wrap around decks, 3 fireplaces with gas logs, outdoor Jacuzzi, workout pool, outdoor shower, murals and well decorated located in the heart of St Simons with the island's best views of Jekyll, Cumberland and enjoy viewing all the ships coming and going from the Brunswick Port. Coast Cottage with Spectacular ocean views! 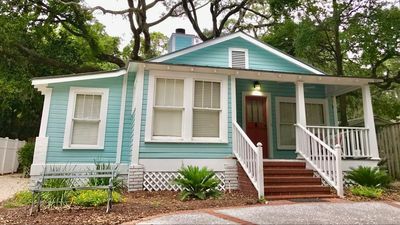 Welcome to the Centennial Cottage at St. Simons Coast Cottages. The Centennial Cottage is located just a few steps from the beach and pools. Our home is beautifully decorated in Beach Cottage decor. Our home sleeps 11 and has 1 King, 2 queen beds, 2 sets of bunks and a daybed. The first floor has 3 bedrooms, 2 of the rooms have queen beds and the third has 2 sets of bunks which sleeps 4. The Master bedroom is located on the top floor and has a king size bed and a spectacular view of the ocean. The sunrise from the Master bedroom is beautiful. The master Suite has it's own private balcony. The third floor has an office with a view of the ocean. The sunroom is also located on the third floor and has a daybed and a great view of the beach & pool. The second floor has the family room, kitchen and dining room. The kitchen has granite countertops, new appliances and white cabinets. 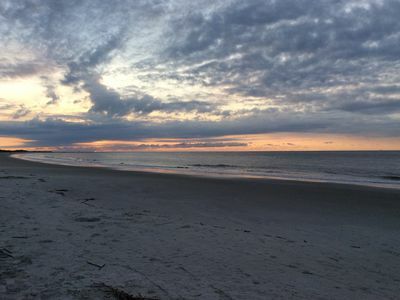 Why the Owner Chose St. Simons Island: St. Simons Island is a very relaxing and slow paced destination. Beaches, great seafood restaurants, fabulous boutique shopping and great golf is mainly what the island offers. Our cottage continues this theme with its relaxing beach decor, comfortable beds and deck furniture. Just steps to the pools and beach and relaxation is yours! The Unique Benefits of this Cottage: The unique benefits you will enjoy by staying at the Coast Cottages is: staying in the best homes on the beach, 2 uncrowded private pools, the only pool/beach pavilion on the beach and the quietest stretch of the beach. This downstairs apartment with private entry is exactly what you need for a cozy beach vacation. A 5 min walk to the beach, 5 min walk from King & Prince, 15 min walk to the village. We provide high-quality bedding, towels and kitchen supplies. We are your home away from home, offering an unforgettable 5-star experience. There s several Restaurants and a bike rental shop just minutes away from this apartment! 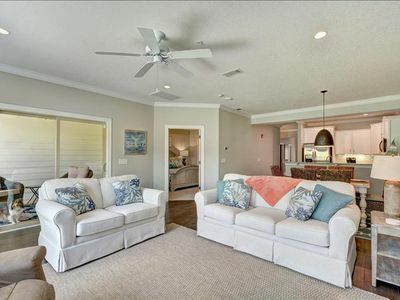 Kick Back And Relax In the Beautiful Townhome located 100 yards from the Beach! Get the relaxation you desire when you stay in our 3 floor unit. 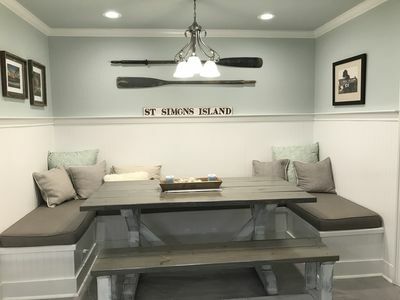 If this is your first trip to St. Simons or you are a regular guest you will immediately notice that this island is very special, peaceful and relaxing. Walk out the front door and to the right about 100 yards and enjoy early morning walks on the beach or catch the sunrise over a cup of coffee. Ideal for honeymooners, couples, retirees, girlfriends and families. Even though we rent our unit it is also our home when we visit the island. That being said, it is equipped with everything you will need for your stay and if you find yourself in need of something we are just a phone call away. As you enter our townhome you will find a half bath, kitchen, dining and living room with access to the back patio. The master bedroom is on the second floor and has a wonderful king size bed along with a full bath. A second bedroom room is also located on the second floor with a comfortable queen size bed and also a full bath. 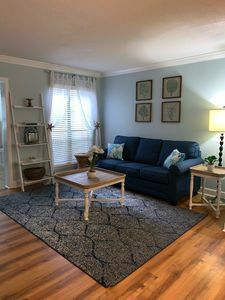 We have TV's in the living area and master bedroom with cable and wireless internet connection. At all times you will be working with the owners of the unit and welcome questions and concerns of the unit and the island. Some may be less expensive but none better! If you decide you are interested in a smaller unit you can take a look at our two one bedroom units in the Ocean Walk Complex. HomeAway/VRBO #3509289 and 150444. MOST “BEST DEAL” GUEST REVIEWS, EAST BEACH, 6 QUEEN BEDS, 6 FREE BIKES, CLEAN! This is a 1200 square foot condo with full kitchen, clean and comfortable, 6 free bikes. WiFi. Sleeps 13 in 4 queen beds plus 2 queen futons plus one twin rollaway bed. 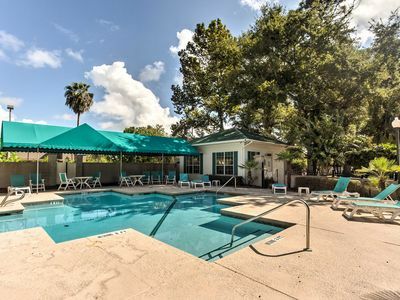 This clean, well maintained condo with pool set among huge live oaks is the best location on the island to anything you want to do. It's a short walk or bike ride (6 free cruiser bikes on your patio) up the sidewalk to the beach at the Old Coast Guard Station (public white powdery sand swimming beach, about 300 yards wide, gets deep very gradually, drive and park in free public parking lot if you don't care to walk). This is also close to Massengale Park, a beachfront public park on Ocean Boulevard with swings, big shade trees, grills, and picnic tables. A reserved marked parking space is just 25 feet from your door. Four queens in bedrooms, two queen futons in living room, plus a twin rollaway -- one full bath upstairs, half bath downstairs -- all linens, towels, cookware furnished. A charcoal grill and wrought iron table and 4 chairs (and the 6 bikes) are on your patio. No smoking indoors. ---EASY TO KNOW YOU'LL LIKE IT: Read all our guest reviews! Our hundreds of past guests say more than we can. If you are looking at another rental WITHOUT guest comments, consider that this is a section that comes with the website, so, if the owner has no guest comments, it may be meaningful. The owner may have deleted bad reviews. An owner can delete all reviews or none! ---EASY TO BEACH: Address is 1500 Demere Road, St. Simons Island, Georgia 31522. 700 yards to the beach. Walk or bicycle, sidewalk all the way, or drive 3 minutes. There's a beautiful pavilion built 2008 with rest rooms and a staffed bbq restaurant at the Old Coast Guard Station, and about 300 parking spaces, all free. Or, enjoy the pool at the condo (closed in cool weather months). --EASY RESERVATIONS: All booking online and the website automatically schedules your reservation. Just click "book it" button on this website and enter credit card or do bank electronic draft. ---EASY RATES: Shown below, easy to calculate, just add up days/weeks/months desired, and that is grand total, nothing added except a $75 cleaning fee ---EASY TO GET IN: You get a numerical code to enter condo and you are in fast. No paperwork to sign or chasing realtors begging for keys. ---STAY CONNECTED-- Your own unshared password protected ATT wifi. 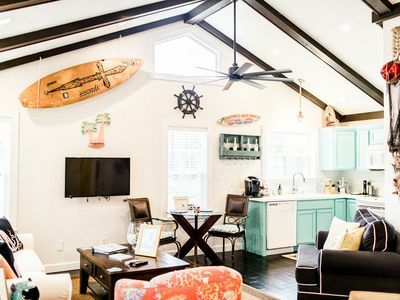 ---EASY TO ENJOY ISLAND WITH OWNER'S TIPS: Owner sends an email with suggestions for inexpensive day trips, restaurants, secret pier for fishing, best beachfront playground, even a low country boil recipe. 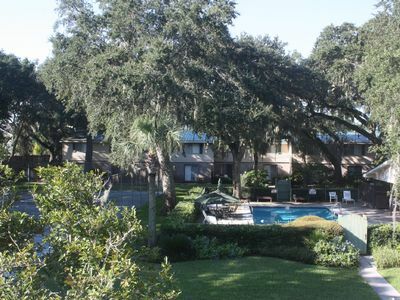 RELAX IN THIS "ISLAND FLAVOR" ST. SIMONS ISLAND CONDO! Best dates are available now.. waiting on your reservation! It is very comfortable and we have many satisfied guests who return each year! Get the relaxation you desire when you stay in this quiet ground floor end unit. No through traffic and just steps from the pool and laundry facility. Ideal for honeymooners, couples, retirees, girlfriends or 'mom's week away'. Our 'island flavor' unit has one bedroom, one bath and is fully furnished with fluffy new linens. A fully-equipped kitchen, king-size bed, walk-in closet, flat screen TV in the living room, 1 TV in the bedroom and wi-fi. Spotless and well maintained. Some may be less expensive, but none are better. Beach Club 204, 2Bd/2bath, complex located on the beach. Beautiful decorated in beach décor, you will love this 2 bedroom, 2 bath unit just steps to the beach. This complex is oceanfront with its own private boardwalk to the beach, the building is in a U-shape with a 2 hot tubs and a fountain located in the middle. The complex also has for guest use a tennis court, fitness center, business center, grills, ocean front pool and baby pool. This unit has a fully equipped kitchen, private balcony, complimentary in-room high speed internet service and washer and dryer. Bedding in the unit is a king, twins and sleeper sofa. Location, location, location! This beach cottage has all the amenities of home but rest just 50 yards from wind swept dunes and white sandy beaches. 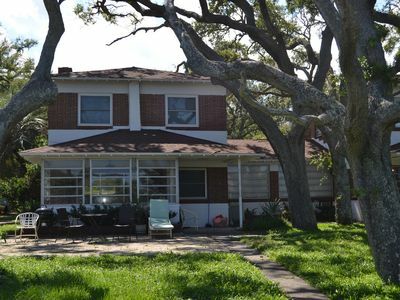 This property has a large grassy back yard with multiple ocean views, shady mature live oaks, and a private beach access path. Each side of the duplex has 3 bedrooms 2/12 baths, a full kitchen with all necessary appliances. Laundry room with washer and dryer. This ocean front property can be rented separately or in its entirety, great for reunions , weddings or just a quite getaway. 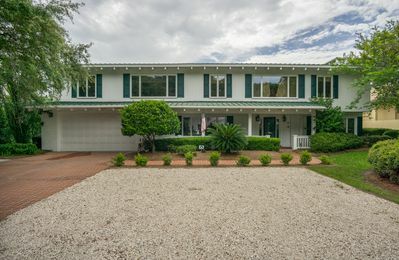 Built in the late 50's, it is one-of-a-kind majestic, ocean front property! MONTHLY DISCOUNTS AVAILABLE. PLEASE SEND AN INQUIRY FOR A QUOTE. FOR GA/FL WEEKEND, ALL GUESTS MUST BE AT LEAST 25 YEARS OF AGE. PHOTO ID WILL BE REQUIRED UPON CHECK-IN. NO EXCEPTIONS. Ocean Walk J14 features newly updated hardwood floors, and new furnishings. Unique for this 2 bedroom condo is the 2nd bedroom has 2 sets of bunk beds. Features include fully equipped kitchen, washer/dryer, and private covered balcony. Wi-Fi is also included. The 16 acre complex offers 2 swimming pools (one is heated), tennis courts, playground, dog park, and an activities building that has ping pong and a fitness room. There' s a nice shaded seating area by the lake for relaxing / feeding ducks. Small Pets considered (please inquire before booking). MINIMUM AGE: 25; NO SMOKING; CK-IN 4:00 p.m. and CK-OUT 10:00 a.m.. FOR MONTHLY RATES, PLEASE SEND US AN INQUIRY FOR A DISCOUNTED QUOTE. Excellent ocean views from this top floor unit! Top to bottom renovation recently completed with new porcelain tile, carpets, bath and kitchen granite, fixtures, cabinetry and furnishings. Soothing colors and top of the line finishes to make your stay enjoyable. Located on the most desirable stretch of East beach, the North Breakers beach is not contingent on tide and the beach is accessible at all times. Two bedrooms (King, Full, Twin, Sleeper Sofa - capacity of 7), two full tile baths with huge shower in master and tub/shower combo in guest bathroom; fully equipped granite/stainless kitchen; spacious living and dining room area with granite wet bar; large balcony with seating and dining areas as well as great views of the ocean; washer dryer in separate laundry room off of the kitchen. Among the amenities are a private pool and sunning deck, hot tub and children's pool. Community grilling station and Wireless internet access provided for your use. There are flat screen HD tv's in the LR along with a DVD and a flat screen in the Master. Wonderful gated access complex with beautiful grounds, covered parking, elevator and secured beach access from the pool deck. Nearby attractions include the Historic Coast Guard Station with it’s brand new WWII museum, iconic local restaurants and the Village and Pier areas for more restaurants and shopping. All are within an easy bike ride or relaxing stroll. We will be happy to offer activity and restaurant suggestions, just ask! This is a non-smoking rental. Smoking is strictly prohibited in all places, including the condo balcony. Non barking, well behaved dogs are welcome subject to an under 35 pound rule of the HOA...sorry! While not ocean front, we have another property (3BR-2.5 bath) nearby that will accommodate larger, non-barking and non-vicious dogs. Please see HomeAway/VRBO listing 4468030. Close to St. Simons Village and East Beach. Bikes included: 2 Adult / 2 child. Comfortable beds (1K,2Q,1Q sofa: sleeps 6-8), towels and furniture makes this the spot to be on the island! 700 yards from beach! Enjoy shopping and dining in St. Simons Village, crabbing at the Pier, walking on East Beach, biking to Red Fern Village, touring Bloody Marsh, Fort Frederica & Christ Church. Take a trolly tour, play miniature golf or the real deal on one of the island's public courses. 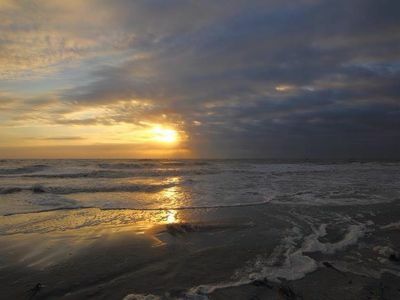 Spend a day on Jekyll Island at the Water Park & tour the National Historic Landmark District. Sea Island, Cumberland Island, Darien, Brunswick and Savannah are also nearby. JUST BEACHY- Walking distance to beach and resturants. Cute as a button but also elegant and classy! 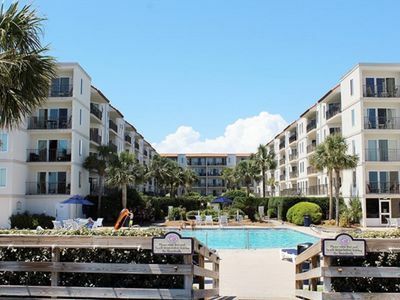 Enjoy all St Simons has to offer in our 3 bed/2 bath condo. Enjoy our neighborhood pool, gym, tennis court and playground. There is a TV in each bedroom and the living room. The laundry room and pantry are just of our fully equipt kitchen and hall. We have WiFi and a desk/work area and sitting area in our sun room. We are a quick drive or walk to shopping and restaurants - just 5 minutes to the beach and Village. 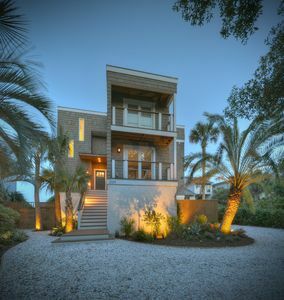 Bright St. Simons Island House - Walk to Beach! Are you looking for your home away from home just 30 seconds from the beach? This fully restored 1920's 2bed/2.5 bath has tons of historic charm, with all the modern conveniences. A 30-second walk to the beach, 5 min walk from King & Prince, 15 min walk to the village. We provide high-quality bedding, towels and kitchen supplies. We are your home away from home, offering an unforgettable 5-star experience. 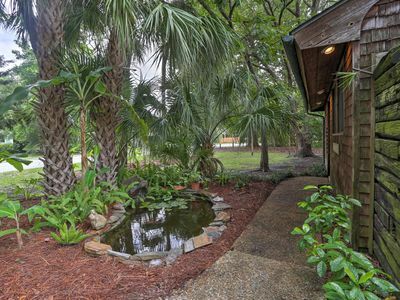 Situated under a canopy of live oaks and only minutes from the beach, the village, the lighthouse and numerous other attractions and restaurants, this house is the perfect place for your island getaway. Comfortably sleeps 9 - master bedroom has a king, additional room has a queen, 3rd room has a bunk bed with a full and a twin, and the couch has a queen fold out. Full updated kitchen, the patio features a charcoal grill. Located on a nice quiet street. Washer/Dryer provided. Pack and play provided. Monthly rates are available. Sorry, no pets! This perfectly located, south island, gated, with pool and fitness center, one bedroom one bath luxury condo comfortable sleeps five. 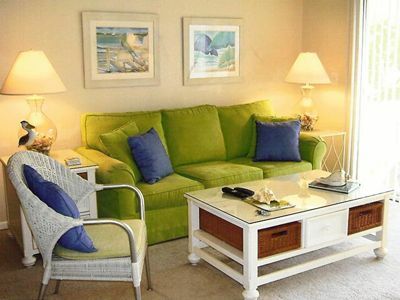 Located near everything, the condo is two miles from the beach and Pier area. The master bedroom has a king bed with a expensive mattress and a remote controlled bed lift. Relax reading or watching TV/ Netflicks sitting up with the bed lift on the HD smart TV. The condo layout provides plenty of room for a queen pullout sofa and a full pullout sofa that are divided by a double sided shiplapped fireplace. This condo is on the second floor with the inside all one level. It is very private and quite as there are no condos above or on any sides of the condo, just one below it. There is a fully stocked, full sized kitchen and washer and dryer in the unit. Right from the HGTV Fixer Upper playbook, we have just remodeled this condo and it is adorned in shiplap, stained ceiling beams, corrugated metal, granite countertops, walk in full tiled shower, hardwood floor. There is tons of natural light from all the windows and we added twelve can lights. The condo comes with free super hi speed wifi and a smart flat screen HD TV in the bedroom and in the living room. 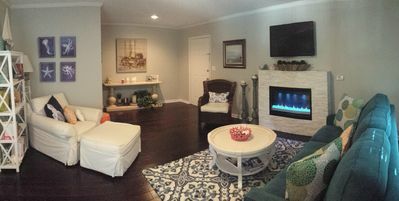 The centerpiece that divides the super large living room is a double sided fireplace. 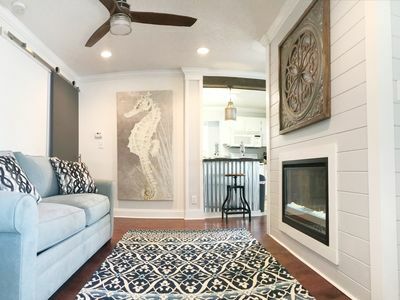 Shiplap coats the outside and one side is a remote controlled LED fireplace while the other is a non working traditional fireplace. Everything is new in this condo. 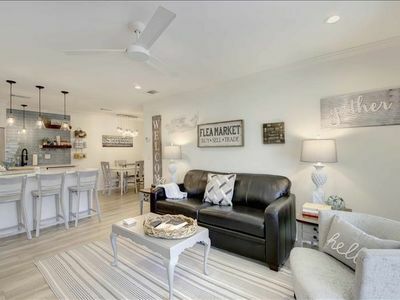 Located in the Island Square condo community, the unit is approximately two miles from the beach, one and a half mile from the Pier area and within walking distance of tons of shops, a Winn Dixie grocery store, starbucks, restaurants and our famous Southern Soul BBQ. Biking or walking anywhere is definitely an good option. The private pool and fitness center are very close to the condo and is open year round. You won't be disappointed in this condo and it will enhance your vacation. Everything we do is designed to make your stay a relaxing experience. Accessing the condo is easy as we use coded door locks, so no keys to fool around with. We simply message you the code ten days prior to your check. If you have a bigger family or vacation with friends, we also own the two bedroom condo that is beside this one. The doors face each other. How perfect is it to be able to stay right beside friends and family. Our two bedroom two bath condo is property number 3996622. If this condo is booked for your dates, never fear. 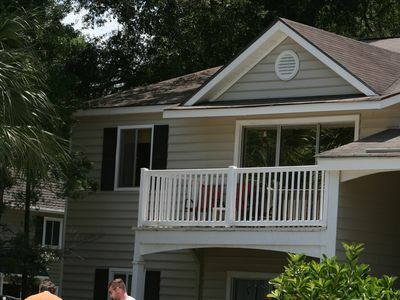 We also have four other vacation rentals. They are property numbers 3690215, 4757544, 3996622 and 4061158. 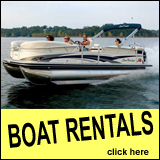 We are experienced vacation property owners/rental managers and have over five years experience. We are confident that you will love our properties and want to return. We are a Preferred Partner with VRBO / Homeaway due to our quick response time, our highly rated and reviewed properties and for providing a high end guest stay experience. We try to be pet friendly and will consider allowing one dog per stay but it must weigh less than 15 lbs and we must approve the pet prior to booking. Thank you. Fall in love with St. Simons Island in this spectacularly furnished 3-bedroom, 2.5-bath vacation townhome with two car garage, Fiddler on the REEF is in a prime location whether you're in the area to golf, swim, or shop, this condo's and its amenities make it the perfect place to relax after a day of exploring the best of the island! This home is perfect for making everlasting memories with your entire family. Relax and enjoy a movie night with plush furnishings in the media room or lounge around in the Livingroom and chit chat for a bit while surrounded by Fiddler on the Reef's beautiful décor. For dinner time there is no doubt that you won't enjoy cooking in a kitchen with boasting expansive counters and lots of storage space, this kitchen has everything you'll need to wow your family and friends with your culinary chops as they take their first bites at the dining table. Be sure to rinse off the sand and before hopping into one of three luxurious bedrooms and cozying up on the spacious beds. Have extra guest? No worries Fiddler on the Reef has two separate pullouts for extra sleeping accommodations. This home can comfortable sleep 11 guest! In the morning, enjoy the salty Island air as you sip your coffee on the screen patio while enjoying the view of the lake. Don't feel like venturing far to enjoy the sun? Just a few steps from your front door you'll find an outdoor pool for that perfect tan and cool relief from the heat. 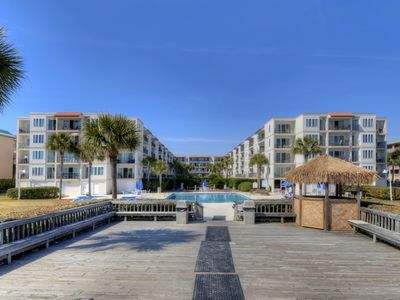 Conveniently located on St.Simons Island Fiddler on the Reef, has everything you need to stay at the beach. There are also annual events to enjoy including Georgia/Florida Football, the Official McGladrey Classic PGA Tour, Jekyll Island Beach Music Festival, and much more…. Together with fascinating history and recreation of all types you will find beautiful marshes, beaches and dinning. This coastal treasure is located on the southern part of Georgia’s scenic coastline. Here you will find miles of untouched beaches and historic landmarks around every bend. The Island's invitingly mild weather is ideal for beach combing, golfing, boating, fishing, shopping, or exploring. After an eventful day of sightseeing, unwind in one of the many delectable Island eateries. From casual to gourmet, from Italian to Continental, the options are mouth-watering! 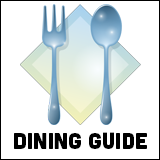 Savor fresh seafood, including genuine Georgia wild white shrimp, hand-cut steaks, unique pastas, southern cuisine, and more. If your St. Simons Island stay includes a weekend, join the locals for a stroll through the Village area. You’ll discover antique shows, arts and crafts fairs, and a variety of cultural pursuits, including Jazz in the Park and The Island Players. Visit the Lighthouse Museum and climb to the top for the best view on the Island! Throughout St. Simons Island and the surrounding coastline, giant oaks draped with Spanish moss, panoramic marsh vistas and coastal wild life delight the senses. BIRD WATCHING TOPS IN THE WORLD OVER 280 SPECIES Great south end location for easy on & off the causeway. GREAT for FLETC or professionals. Pets considered on an individual basis with non-refundable deposit. ACCEPT FULL FLETC per diem for professionals. This Cozy and Comfortable Condo sits up overlooking the Tropical Pool. Located in Ocean Walk on Mallory Street, we are just a short walk or bike ride to the Village area with Shops, Pubs, Restaurant and the Saint Simons Pier. If its eating, fishing or people watching, this beautiful Village has something for everyone. Please feel free to view more information about both of our 1BR Vacation Rentals located in Ocean Walk This Ocean Walk Condo has just been completely upgraded to provide a very inviting get-away. The living area, dining area and kitchen have been redecorated for a beautiful, yet comfortable resort feel. Looking off this second floor from your bedroom or deck, you will find the relaxing view of palm trees and the incredible heated pool for your enjoyment all year round. 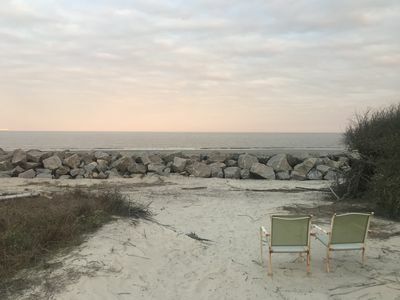 If you just need a couple days of relaxation, a retreat with girlfriends, romantic honeymoon retreat or a time to make those memories with the family, St. Simons Island, Georgia would like to be your next vacation spot. We look forward to seeing you! 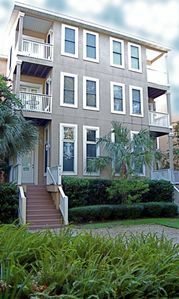 Call today about renting one of our 1 Bedroom Vacation Rentals located in Ocean Walk, St Simons Island, Georgia.